The voice-controlled BB-8 droid from Spin Master. Fans of "The Force Awakens" are in love with the newest "Star Wars" droid: BB-8. The white-and-orange, roly-poly 'bot, full of sass and personality, is winning hearts across the galaxy. 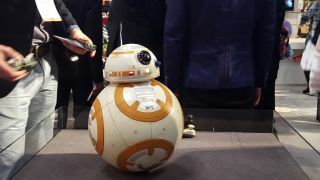 So it's no surprise that we saw an army of BB-8 toys at New York Toy Fair this year. From cake pans and car chargers to an almost completely realistic robot version of BB-8, there will be plenty of ways to get the adorable droid into your home. Spin Master's near-life-size, voice-controlled version of BB-8 was easily one of the coolest toys we saw at Toy Fair this year. The robot stands only 7 inches (18 centimeters) shorter than the droid from the movie and includes incredible responsive technology that lets BB-8 "talk" to you. This also makes the droid freak out when you say words like "Stormtrooper." The toy has a supercool "follow-me" mode, too, which means the little guy will tag along at your heels wherever you walk. The BB-8 car charger fits in a standard cupholder. Take BB-8 with you wherever you go with this BB-8 cupholder car charger from ThinkGeek. The droid is a fully functioning USB charger that can charge two tablets simultaneously. Pre-order the little droid now and have it in your car by mid-April. This new toy from Uncle Milton takes the concept of a classic spinning top to a whole new level — and not just because it's shaped like a little BB-8. The spinner works like a regular top, but is made with a built-in magnet and comes with a force pusher (aka, another magnet), so kids can guide the top toward little plastic ramps. Each of the three ramps included with the the toy has a different texture that will either slow the toy down with friction or provide acceleration and momentum. It's a creative way to introduce kids to some basic physics concepts, and will be available later this year. One of the new "Star Wars" Lego sets featuring BB-8. The detail in little Lego figurines might be one of the best parts of this classic toy series. Somehow, the toy masters at Lego are able to shrink famous people and fictional characters and still make them recognizable. The tiny Lego BB-8 has already made appearances in other "Star Wars" Lego sets, but look for it in some of the new sets coming out later this year. A BB-8 pasta container from Underground Toys. Want some BB-8 in your kitchen? Of course you do. And with the new BB-8-shaped cake pans, pasta container and collectible plates from Underground Toys, it's easier than ever. As with many of the items from Underground Toys, the BB-8 plates in particular are surprisingly classy, so you can show off your love of "Star Wars" and quality design work simultaneously. You can find products by Underground Toys at various retailers including Walmart, Target and Toys 'R' Us. Many of their items are also available on Amazon. Just like the droid from the movie, most BB-8 toys we saw were made of metal or hard plastic. But we did find one BB-8 toy that's fit for hugging. This giant BB-8 plush, also from Underground Toys, will be the perfect addition to any nerdy stuffed-toy collection (which should also include this incredibly cute Pluto and Charon set).